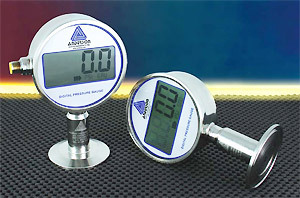 The Anderson Digital Pressure Gauge platform is designed specifically for monitoring critical pressures in sanitary BioPharmaceutical applications. The product line was developed to address several trends relative to performance, safety, and readability criteria of our core customers. When compared to mechanical gauges these electronic units provide much better accuracy, resolution, and over-range capability, and are backed by a 2 year warranty! The switch version provides all this, PLUS 2 fully adjustable switches with low-voltage relay outputs for simple control and/or alarming. With the elimination of mechanical actuation comes improved reliability. Several other features have been incorporated that customers will find beneficial including a simple, tamper-resistant user interface for easy calibration and programming. The units are programmable for engineering units and all compound units boast auto-scaling to the appropriate units. There’s also a "min/max" capture feature that can be used for troubleshooting your process and equipment. Powered by two "AA" batteries, the Digital Pressure Gauge will operate for at least a year before the "low battery" indicator comes on. The switch version operates on DC loop power with battery back up to support off-site programming. Like all Anderson Pharmaceutical-Series products, these instruments are designed to meet the most stringent requirements of the industry. They are constructed entirely of welded stainless steel, not simply industrial or test gauges with sanitary seals added. They are designed to be cleaned and steamed in place (CIP/SIP) and meet the current ASME BPE standards. All wettable parts are 316L stainless steel, electropolished to an Ra of 8 Microinches (0.2 microns). Each is provided with a complete documentation package including material, conformance, and calibration certifications as standard.